Any multi-user cryptographic primitives need revocation since a legitimate user may quit the organization, or may turn to be malicious, or the key may be leaked. In the group signature context, usually group manager publishes the revocation list that contains revocation tokens. Since signers/verifiers need to obtain the revocation list in each revocation epoch for generating/verifying a group signature, a small-size revocation list is really important in practice. However, all previous revocable group signatures require at least O(r)-size revocation list, where r is the number of revoked users. 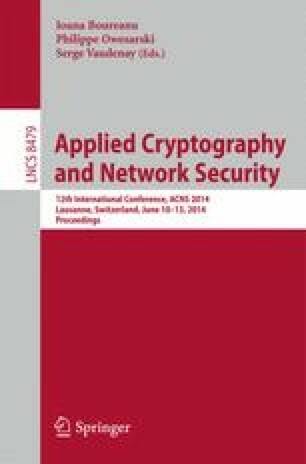 In this paper, we propose the first revocable group signature scheme with the constant size revocation list from identity-based revocation (IBR) techniques. We use an IBR scheme proposed by Attrapadung-Libert-Panafieu (PKC2011) as a building block. Although the maximum number of the revoked users needs to be fixed in the setup phase, however, the maximum number of group members is potentially unbounded (as in IBR). This property has not been achieved in the recent scalable revocable group signature schemes, and seems to be of independent interest.